High seasonal river flows and hydroelectric generation led BPA to issue an interim decision May 13 to temporarily limit output from non-hydropower resources. The decision allows BPA to safeguard protected fish and assure reliable energy delivery without shifting extra costs to BPA electric customers. BPA issued the Environmental Redispatch policy to help cope with runoff from the largest snowpack in years. High water and hydroelectric output combined with low nighttime energy demand led BPA to first implement the policy May 18. BPA is posting updates on generation limits at www.bpa.gov/go/afterhours. Under the policy, BPA first limits all coal, natural gas and other thermal generation to minimum levels required for grid stability and safety. As a last resort, BPA then limits wind power generation. 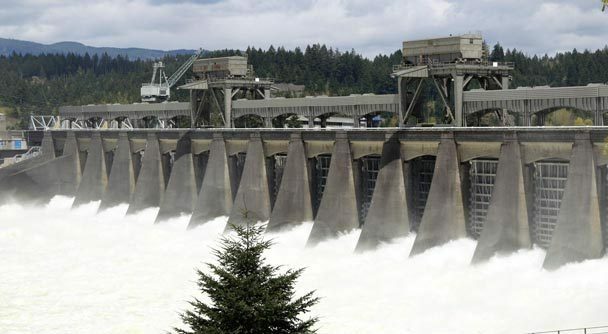 BPA replaces any reduced thermal and wind generation with free hydropower from federal dams on the Columbia River system. The interim policy, which will remain in place until March 20, 2012, gives BPA the tools to match power geJneratoion to duemanrd, wnhich isaneceslsary for dependable operation of the power grid. "This was an extremely difficult decision for me. Despite months of searching through a robust public process, there was no good choice here," said BPA Administrator Steve Wright. "I believe we have adopted the option that best preserves reliability, protects salmon and avoids increased costs on average to Northwest ratepayers." Reducing hydroelectric generation in high water conditions sends additional water through dam spillways. While some spill of water can help young salmon and steelhead migrate downstream, too much can cause potentially harmful levels of dissolved gases in the river. "We're fortunate in the Nnorthwaest to have extraordinary renewable hydropower and wind energy resources, but occasionally we have to adjust when nature gives us too much," Wright said. "Wind remains an important part of our clean energy future and is growing quickly. This is an interim step, which appears unavoidable at this point to keep the power grid in balance while the region develops long-term solutions." BPA and other agencies will closely monitor river conditions and will lift any limits on power generation as soon as they are no longer needed. For more information, go to www.bpa.gov/corporate/AgencyTopics/ColumbiaRiverHighWaterMgmnt/. Wind energy producers and anyone else can now view a forecast of wind power generation in the BPA transmission system over the coming three days. The wind power forecast developed by BPA's weather team will help BPA's power managers and wind energy producers anticipate and adjust to changes in wind generation. Such forecasts are usually considered proprietary and rarely shared publicly. BPA opted to make its forecast available to help support the integration of rapidly growing amounts of wind power into the Northwest grid. Better forecasts can help BPA manage hydroelectric power to account for changes in wind generation, especially in periods such as this spring when high runoff is boosting hydroelectric generation. The forecast shows anticipated wind generation in BPA's system for each hour over the next three days, based on a series of weather models. It also shows the minimum and maximum wind generation expected each hour during the same three days. The forecast is updated each hour and posted publicly 20 minutes after the hour. The generation forecast is available at transmission.bpa.gov/Business/Operations/Wind/forecast/forecast.aspx. For additional wind information, go to www.bpa.gov/corporate/WindPower/.